£6 For lunch and a pint/wine/soft drink Every Weekday! Monday- Our famous Homemade burgers are 1/2 Price all day and night! Tuesday- Poker night! £5 buy in, Game starts at 8pm, get in early as places are limited! Thursday- T-bone for a Tenner! £10 for a sizzling t-bone with chips grilled tomato, fried onion and mushrooms! Cocktails half price all night long! Choose from 14 different bottles of wine for £10 when you dine with us! 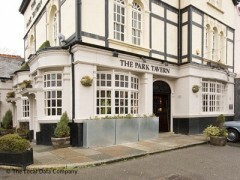 The Park Tavern offers buffet catering for private parties of up to 200 people. £100 FREE bar-tab when you book a party (60+ people) with us!! Dance floor, DJ, Live Music welcome! G'day. This is Ian here. I was at the park tavern on Sunday for lunch with my beautiful wife and it was awesome. I must admit I was hank marvin. The meal I chose was roast beef and it tasted just how mum makes it back home and was a decent size. There is a New Years eve bash here, and Karike and I will definately be there with a group of our freinds to see it in. We met Patrick who I believe is one of the owners and his service was great which says alot considering he was working on a Sunday. The polish girl behind the bar was freindly and efficent. They serve corona which is always a plus for me and it is only just down the road from home which is even better.